LISTEN NOW! As Greg and Pat discuss how it’s going to be a physical battle too not just a spiritual battle so be prepared. 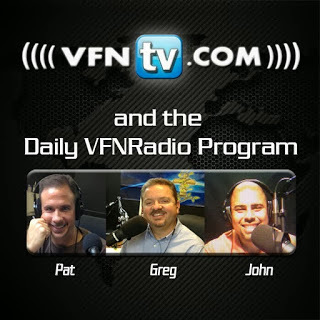 They continue to discuss how VFNRadio and VFNtv is a NOW WORD! They discuss a prophetic word given to Greg regarding what is to come. When God speaks we must evaluate our response to what He is saying. He will continue to speak almost like the rhythmic pattern of labor pains when birthing a child. As time for delivery approaches the pains become sharper and more frequently less we repent. God wants us to turn back to Him. When one goes before the judge he understands the judge will put things back in order. Greg shares how he was shown a military air training where Americans and Saudi’s were trained. In this prophetic experience he was attending a diverse unity gathering. Suddenly a military base on the gulf coast came under attack. He continued to look south toward the Naval Air Station in Pensacola when he saw a huge explosion and right after there was another explosion. He got into his truck at first to respond but then turned to warn everyone that this is not just going to be spiritual but it’s going to be physical. He continues to share how people don’t like us. We need to prepare and not with “cheerios” but to prepare for people who intentionally want to harm you. Our Naval power will be under attack as they share how Brett saw the military chased by red air craft. At this time Christians were under attack all the while people were looking in the air. They continue to discuss the dream Brett had when he saw two air plane pilots from the United Emirates. Planes were being shot down and Brett warned the people. He even saw where they had to put bayonets on indicating a battle on the land. God told Brett to get this out to Greg and Pat so they can get the word out over the air. Some will be tempted to discredit this reality from happening but a wise person prepares. They further discuss a dream Greg had where it was revealed to him that a war is very specific and that logistics take a while however God showed him that terrorist attacks take 60 years to accomplish. So what does God mean? It will be 60 years in 2014 which just happens to be the year of the first of the four blood moons that NASA is predicting. God told Greg to look back at what happened in America 60 years ago which is 1954. In 1954 the nation tuned into the McCarthy hearings and they were successful at polarizing him as the public face but he was trying to warn the people how communism had infiltrated our government. He warned about how communist subversion was coming to our country. They broadcasted the hearing for 35 days but no one was listening to him. It is very similar to what Congresswoman Michelle Bachman and Senator Ted Cruz has been warning us regarding the infiltration and penetration of the Muslim Brotherhood in our nation even in the White House. It looks like McCarthy was right. They continue to remind us of what Brother Kilpatrick said when he said stand with God. Don’t be scarred. The question is what does a physical battle look like? They further discuss three of four dreams given to an 11 year old boy. The first dream involved the North Korean dictator and Christian persecuted Kim Jong- il coming to the White House and in the dream the young boy understood that he killed everybody. In the same dream the 11 year old boy was taken to a safe room where President Obama was and the President begged the 11 year old boy to help him escape through the window and he did. He also saw in another dream where everything was destroyed, massive deaths, and many who were dead. In another dream he saw where the city went from high tech to nothing. He saw people setting up all kinds of stands to barter and he even saw people stealing everything including gasoline as well as people themselves were being mugged. They continue to discuss what is was like to go through five hurricanes in one year. We can’t rely on FEMA to come in and do everything. Even the police officers have families too. Imagine this happening to a nation where most people are not prepared. Many today are living pay check to pay check and will be surprised as to how quickly super market shelves will go empty. They encourage us to prepare in context for crazy things to happen and to protect your home, family, and the elderly. They discuss there is going to be physical calamities and law enforcement will be overwhelmed and will need you to help. They continue to share how this is all part of a strategy to overwhelm the system causing it to have to reboot but when it does it will not be good. They remind us that if we turn to God we will win. There are more for us than there are against us. As Greg and Pat discuss how Greg was introduced to the organization LIVE HOPE LEARN from Luis Lopez. The organization says that $4 per month is all it takes to feed and educate 1 child for an entire month in the country of Haiti. Greg continues to share how God used Haiti’s earthquake to confirm a direction in ministry as his heart was broken over what had happened to the people of Haiti.